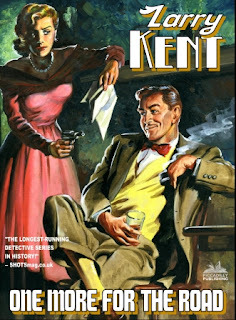 Private Eye Larry Kent started his life as the hero of a half-hour radio show on Australia’s Macquarie Network, and was inspired chiefly by the success of the hardboiled mysteries of Carter Brown. As the popularity of the radio show grew, the Cleveland Publishing Pty. Ltd decided to publish a series of Larry Kent novels. Two authors, Don Haring (an American who lived in Australia) and Des R Dunn (a Queenslander) are primarily associated with the series. Between 1954 and 1983, Larry appeared in well over 400 adventures. 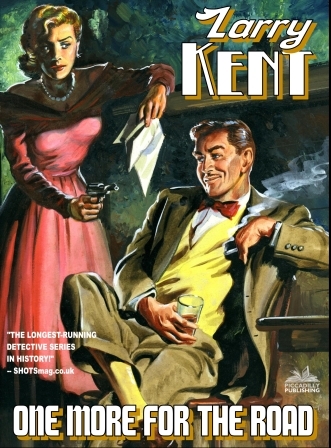 Kent is a typical hard boiled private eye. He smokes Camels, drinks whiskey and within the first dozen pages or so, has usually met a dame and is fighting for his life. His mean streets are pure New York (although the radio series was set in Australia) and include Harlem nightclubs and Jersey roadhouses. Generally the body counts are high: about six deaths per novel. But there’s another side to Larry Kent. He’s a Vietnam war veteran, he used to work for the CIA and still does, usually reluctantly, on occasion. And once, when an attempt was made on his life, the Agency paid for him to have plastic surgery that altered his appearance ... something he never quite managed to get used to. Larry Kent is fast and fun, and Piccadilly Publishing is proud to be bringing his cases to a whole new generation of fans, complete with their original ‘good girl’ artwork. The first FOUR books will be available on APRIL 4th! A Thompson machine gun erupted its violence as soon as the door began to move. A guy stood in the opening, his big gun smoking in his hand. I took one shot and sent a shell into his stomach. The guy went back on his heels for two very deliberate paces, then folded onto his knees. His gun slipped out of his hands and came into the doorway. There was another guy with my dying friend—a guy with the most surprised face in New York. He wore a hat over his eyes, but I could see a crooked nose and thin lips and a fat-jowled jaw. There’s something about me makes me ornery when guys pump lead into my doorway late at night. Cool. I used to see them occasionally on our book hunting trips to England and never had trouble selling any that I could get my hands on. Never read one but I enjoyed the covers. "The longest-running detective series in history," says the cover blurb. No way. Sexton Blake ran from 1893 to 1978 ... more than 4,000 stories by some 200 different authors. For a quick check go to Wikipedia.